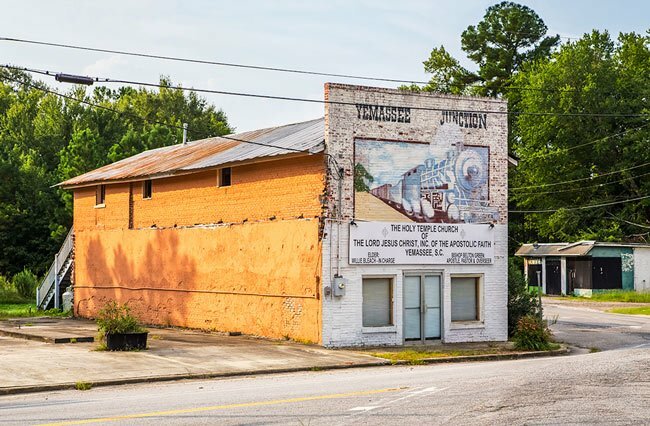 This colorful mural on a former general merchandise store built in 1912 in Yemassee commemorates the wartime railroad that marked the beginning of life as a United States marine for more than 500,000 recruits. The railroad was owned by Atlantic Coast Line, and the Marine Corps ended its lease with the transportation company in 1965. Amtrak and CSX now utilize the railway. 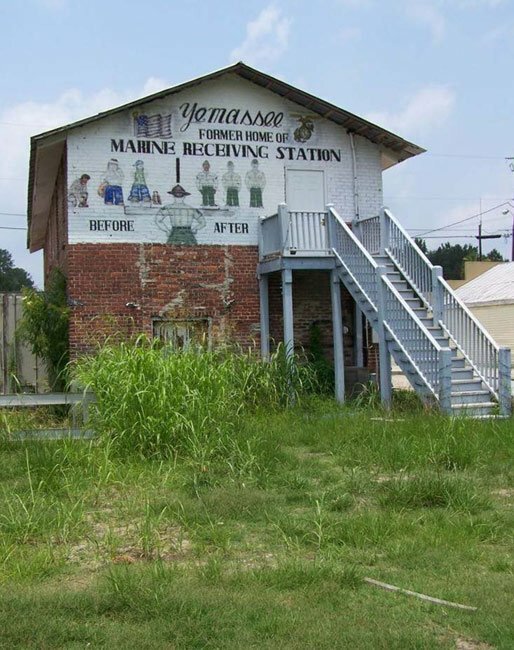 Between 1914 and 1965, half-a-million future soldiers boarded the train at the Yemassee depot and were carried to nearby Parris Island for military training. More than half of these recruits arrived during World War II. This building served as the receiving station. The vibrant storefront now serves as a local church and boasts with artistic pride the historic rite-of-passage that took place outside its doors. The top photos display the artwork on the building’s front, while the photo below shows a mural on the back entrance depicting the evolution of marine recruits. The depot itself, seen below, sits along the Beaufort County–Hampton County border. 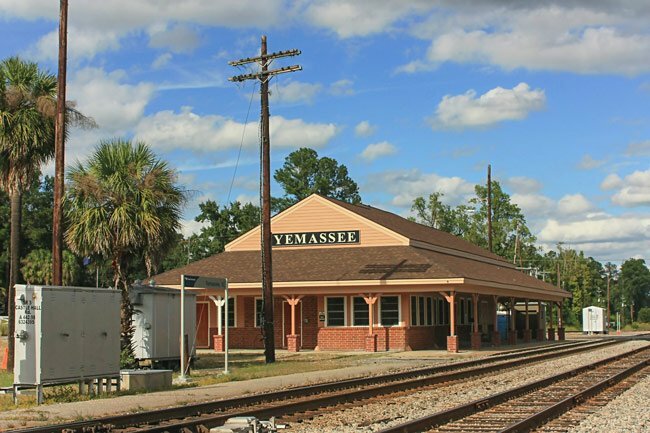 It was purchased by the Town of Yemassee from CSX for one dollar in 2010 as project of the Yemassee Revitalization Corporation. It was then restored to its 1940s appearance. In 2003, a former Marine who had passed through this depot arranged a reunion for other Marine recruits who began their military careers after stepping off the train here. Since then, the reunion has been held in various nearby locations, including Parris Island and the Beaufort Marine Corps Air Station. Hundreds of Marines from across the nation attend the annual event. Ann, that is wonderful of you to try and locate the family of these people and get the photos back to the people attached to them. Thank you so much for doing that. Unfortunately we have not been able to locate Cole’s Lake either. 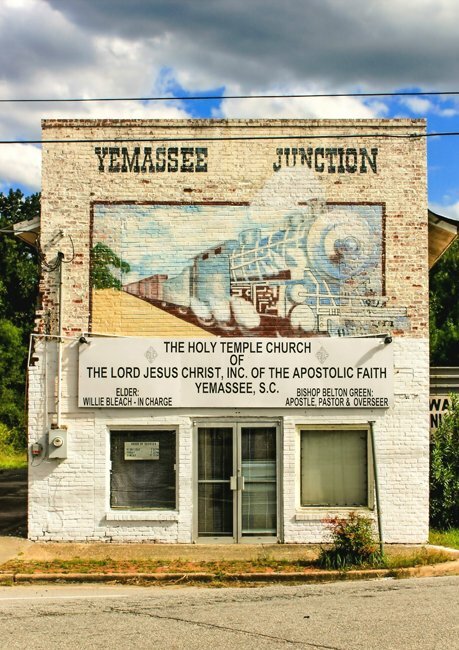 If it around Yemassee, we have never heard of it. Do you know if it looks like maybe it was a private lake on someone’s property and maybe named for their surname or some sort of situation like that? Do any of the other photos of this family have any types of identifying information? I am trying to locate Cole’s Lake. I have a photo believed to be taken +/- 1930. It was processed at Globe Photo, Greenville, SC. Two names were written on the back: Helen Neal and Mrs. Grady W. Nicholson. I cannot seem to find that family, but I have many more photos of this family. I would like some help. I Googled Cole’s Lake, SC and was led to this Yemassee website. I am hoping you may be able to direct me to Cole’s Lake if not in your area. My husband and I have owned and operated a Antique Mall in Tryon, NC for 14+ years, and I have received a lot of photos from many estates and we have recently retired. I have returned many military and family photos to those who may care. Personally, I have no children, and it is somewhat of a “mission” for me to find those who may appreciate them. Hi, Tom! I think Dr. Coward is referring to the blue engine in the top photo, noticing that the one from Alcolu and the one in the Yemassee mural are both the same color and rare for a train. The comments below have nothing to do with Yemassee. They refer to the Alcolu Railroad and Paroda Railroad of Sumter and Clarendon Counties in the “Sand Hills” of mid state. D. W. Alderman created both as common carriers using logging railroad roads useful to the Alderman mill at Alcolu, SC near Manning. Both Yemassee and. 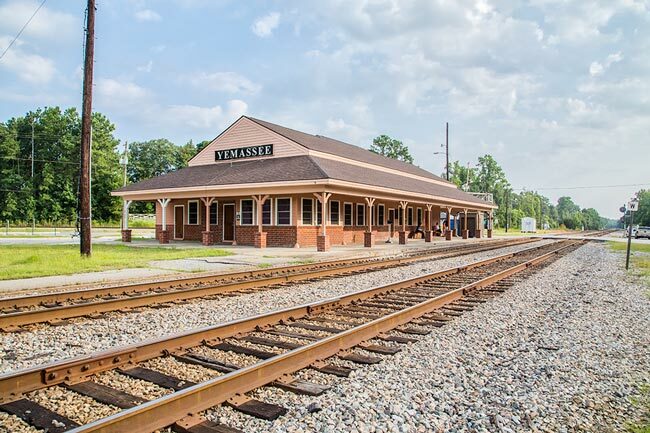 Alcolu are on Atlantic Coast Line routes, but Yemassee is on the Charleston to Savannah mainline, and Alcolu is on the Central RR of South Carolina from Lanes to Sumter. Tom F.
He called his local station Green Hill, and there was a stop along the train’s route called Paroda (Paul, Robert, David). “Seloc”, painted by Jerry Locklair, shows the Alcolu railroad in front of J. F. Coles (Seloc backwards) store near Lynchburg. My great-grandfather founded the village of Alcolu with its DW Alderman & Sons lumber mill. As a Christmas gift, he gave his 3 surviving sons a passenger train (a real train), and its colors were baby blue. How many baby blue locomotives could there be out there! Any idea about the background of this engine at Yemassee?